Who travels with maker tools in their luggage! Patricia Aigner, that’s who! And that’s how the two of us ended up with dual Cricuts during an unplanned popup maker space at our VermontFest 2017 - Vermont’s Fall educational technology conference. When I saw Patricia unpack her Cricut maker, I knew I had a maker ed sister. If you don’t know Patricia, she serves as Director of Technology for Rutland City Public Schools and President of Vita-Learn. She teachs a course for the Castleton Center for Schools, The Cricut in Education. Patricia has a big WHY for the Maker Movement. She shared, “Making, creating, designing, inventing and tinkering are quintessential American activities. Consider that the American patent system is the backbone of our innovation economy and Americans patent more new ideas than any other country except China. Alexander Graham Bell, the Wright Brothers, Henry Ford and many other Americans tinkered and invented. Without opportunities to Create, Make and Learn our students may not ever have the chance to use tools, develop design thinking or engineering skills. That would be a huge loss to our economy and limit our students’ opportunities. " Recently we received an email from an educator who had been inspired by the dueling Cricuts at our pop-up space, but wanted more ideas about how she might use it with younger learners. 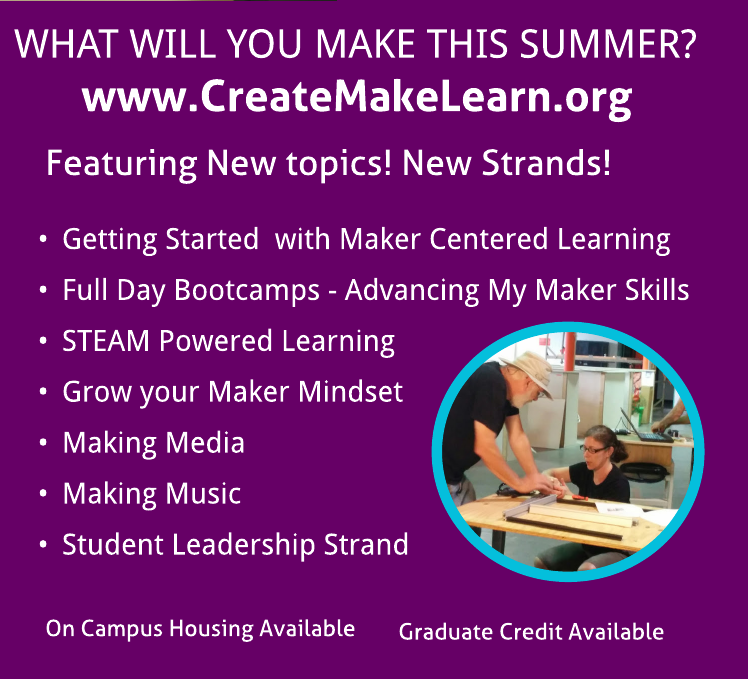 Kudos to her for asking WHY before purchasing a new maker tool! I asked Patricia if she would help us out with a blog post that could inspire teachers of younger learners with ideas of how they might use such an accessible tool like the Cricut Maker or Explorer in their classroom. 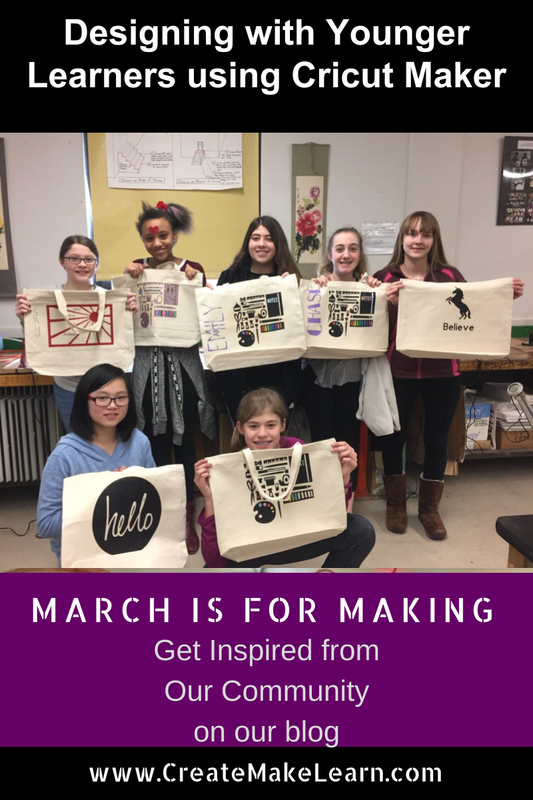 Thank you Patricia for being our Guest Blogger in today’s March is for Making Series. 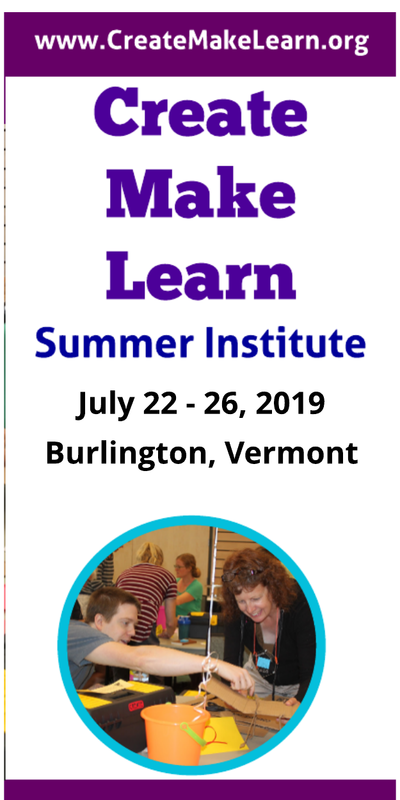 I was a skeptic about the Cricut until I spent time with Karen McCalla in the Maker Space at VermontFest in 2016. She had a vision of creating phrase walls in her school using window cling. Her idea aligned perfectly with the positive sticky note campaign we use at the RHS and RMS to promote civility and citizenship among kids. Jack Adams and I worked with RMS middle school students to select “R.E.A.L.” (Responsibility, Excellence, Acceptance and Leadership) quotes and adhere them to a long windowed catwalk where students enter the school. Although the Cricut has many images in the Design Space software created by professionals, Jack Adams, Deb Jiloty and Laurie Wilson encourage our students to create their own designs using a wide variety of drawing software. Students then cut the images on vinyl, cardstock and other materials. 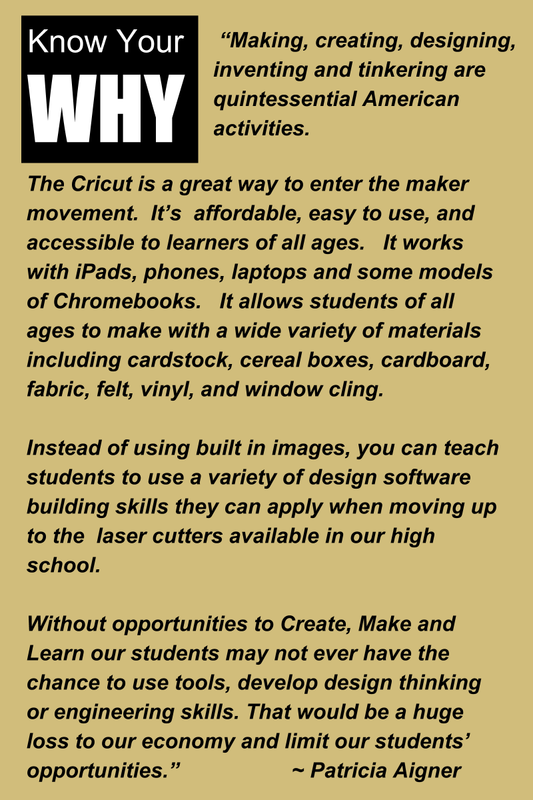 I consider the Cricut a segue to our two $15,000 laser cutters located at the RHS and STC. It is really easy to get started with a Cricut Maker in your classroom. The web based Cricut Design Space software works with an iPad, phone, Windows machine and Apple computers. There is even an Android App in Beta, which works with some models of Chromebooks. You can use a wide variety of materials including cardstock, cereal boxes, cardboard, fabric, felt, vinyl and window cling. The list is too extensive to describe so I am including it here. Lucie asked me to identify some projects that could be successful with young students. Young students can help build window and vinyl cling word walls, equations and more. They can design subitizing graphics that adhere to small objects like wooden blocks. They can even select and help cut images to put under a BeeBot Mat for phonics practice and skip counting. If you are looking for something super easy, there are options built into the Design Space. That is how I got started. I went to the online software and took a few screenshots to share with you. Puppet Theatre for Storytelling. Made from cardstock or other heavy duty material. This theatre could be used to retell all sorts of stories by young children. Cardstock, wall or window cling butterfly life cycle, weather cycle, etc. There are endless images available or you can upload your own. Here is an example of a window cling aquarium. Terrariums with different themes using Vinyl on a glass jar. Here is an example from the Design Space with dinosaurs. Printable sticker paper. The “Print then Cut” feature in the Design Space allows for endless color possibilities by using your color printer and the Cricut. Choose images or upload your own. Students can stick them to books and other objects. Silhouettes have been around forever. You can upload silhouettes of your students and cut them out using fabric, wall vinyl, window cling, cardstock, etc. Here is an example of a silhouette from the Design Space. I am a big fan of circuits. With a Cricut you can design and cut out objects and images, buildings, bookmarks and also make luminaries. Here is a Halloween Luminary, but really you could use your own images like dragonflies and lightning bugs. Another example is a village. It would be amazing to recreate your downtown or school in cardboard. Then add LEDs. A local building in cardboard could serve as an interesting backdrop for 3D Vermont. Finger puppets are an adorable and fun way for students to tell stories, explain how things work and get practice speaking out loud. There are fabric and cardboard finger puppets in the Design Space. These are made from felt. And these are made of cardstock. Kids and adults love photo props; this is evident from Instagram! Here are some photo props and masks (n the Design Space there are many more). Or you could design your own. Students enjoy assembling materials. I think I would cut and print these animals using heavy duty cardstock. There are dinosaurs and other objects students can assemble. If you plant beans or other vegetables with students, you can help them decorate their plastic or clay pots prior to planting. Using vinyl, you could print their names, the plant type or attractive designs. Here is an example. You could make plant markers, too. If your students like to draw, you can scan their drawings using a copier that scans and email the images to you. Save the file as a .jpeg format so that you can import it into the Design Space. From there, you can “Print then Cut”, or cut out the image using any of the materials listed above. If your students draw digitally you can save their images in a .jpg, or .png format to import and modify in the Design Space. 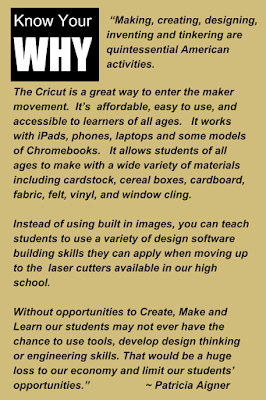 To learn more about importing and working with images visit Cricut Help. https://help.cricut.com/help/uploading-images-design-space. I have many more ideas for K12. If you want to see something amazing, visit the image I cut from a photo of Dr. Martin Luther King, Jr. And, feel free to ask me questions, or check out my student products on Twitter.